“In communicating with Pope Francis, we told him about the fact that Ukraine is the victim of the aggression of a neighboring country." The Head of the UGCC also told journalists about the pastoral ministry of the UGCC in conditions of war and the social work of various charitable organizations that are offering aid to the refugees and to those who have been wounded in the war. “Today almost 80% of Ukrainian society is involved in various sorts of volunteer activity. 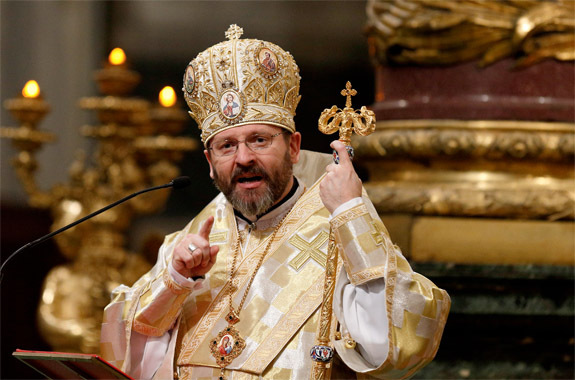 People join together, helping one another, regardless of religious affiliation,” and this, according to His Beatitude Sviatoslav, “is genuine, practical ecumenism. Religious peace, which we have succeeded in preserving in our society, is a great treasure for us.” The hierarchs of the UGCC also turned to the Holy Father asking him to contribute toward overcoming this humanitarian catastrophe with the assistance of the international community.